These 2 Simulation Car Railing Metal Handrail are specifically for 1:10 RC Crawler Traxxas HSP Redcat RC4WD Tamiya Axial scx10 D90 HPI Crawler Car. Improve the authenticity of the remote control car. Made of high quality metal; Easy to install and durable. Increase the simulation of car shell. 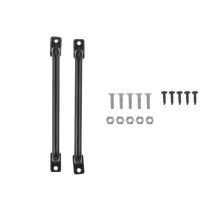 Mounts with screws through the holes on the ends. Suit for 1:10 RC Crawler Traxxas HSP Redcat RC4WD Tamiya Axial Car scx10 D90 HPI.